I realize something, as I step on a plane bound for Tucson—I have absolutely no impression whatsoever of the craft beer scene or culture of Arizona. This is a pretty damn rare thing for me to be able to say in 2016 (or 2015, when I made the trip). As someone who has been writing obsessively about craft beer for years now, my knowledge of individual breweries and regions tends toward the encyclopedic. Sit me down with a map of Illinois or Wisconsin and I can draw you a huge connect-the-dots of my favorite breweries. But Arizona? I’ve never even really been to the Southwest in earnest. I’ve barely ever sampled a beer from Arizona, because none of the breweries are really big enough to distribute to the Midwest or the East Coast. I don’t know any of the reputations of these companies. The whole thing is a giant blank space, waiting to be filled in. That impression of being a stranger in a strange land only increases when I exit the plane. This isn’t like driving to Alabama to sample some beers in Huntsville, or flying to California to attend the Firestone Walker Invitational in wine country. Arizona truly feels different on a bigger scale. Everywhere you look, the landscape and the streets are dotted with towering Saguaro cactus. Every other building is a perfect cube of smooth, autumnally colored adobe. I don’t think I’ve ever walked into a new city and immediately seen an identity so polar from a childhood in Midwestern suburbia. Even the street art is different. What I found in the beer scene is a craft beer community in transition—growing quickly, but still quite insular. Tucson is interesting in the sense that there isn’t a “local kingpin,” a regional craft brewer that is sending its product several states over. Even though there are some local breweries that have been evangelizing better beer for decades, they’re still relatively small, and they still feel “local.” One gets the sense that the only way you can actually experience Tucson beer is to simply come to Tucson. If a day ever comes when I don’t want something called “Coffee & Donuts Stout,” then I will need you to take me out behind the barn and put me down humanely, as I will have outlived all usefulness or potential for joy. Ahem. Which is to say, I was excited when I walked into Ten Fifty-Five and found a beer by that name. This small taproom was where I kicked off my Tucson beer excursion, and in many ways it set the tone. Located in an industrial park, just a few doors down from longtime area stalwart Nimbus Brewing, it feels every bit the experimental start-up, even though the fact that it’s coming up on its two-year anniversary makes it a “veteran” presence among Tucson’s many new breweries. But aesthetically, Ten Fifty-Five is almost what we’ve come to expect in new, small breweries—located out of the way, with a DIY aesthetic and a confidence that good beer will compel visitors to venture off the beaten path to fill a growler. The beers here are eclectic, well-balanced and decorated with local awards, including the whimsical “Iron Brewer” trophy decorating the tap area, which Ten Fifty-Five won in a yearly competition to incorporate a specific ingredient—in this case grapefruit, via a grapefruit IPA. 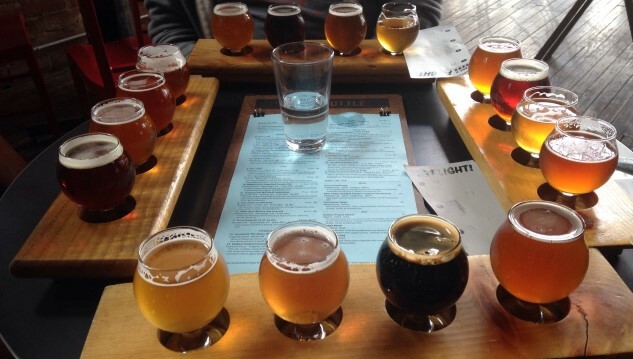 Other highlights include the series of coffee and cacao-infused stouts, and the vibrant Two Sons Citra, a DIPA. Particularly creative was a one-off beer called Our Valentine—a very ambitious “all-Arizona” pale ale that incorporated rare, Arizona-grown barley and wild hops, not exactly easy to come by in the desert. You’ve got to applaud the effort to specifically highlight the fact that all regions of the United States have now become craft beer regions. 2. 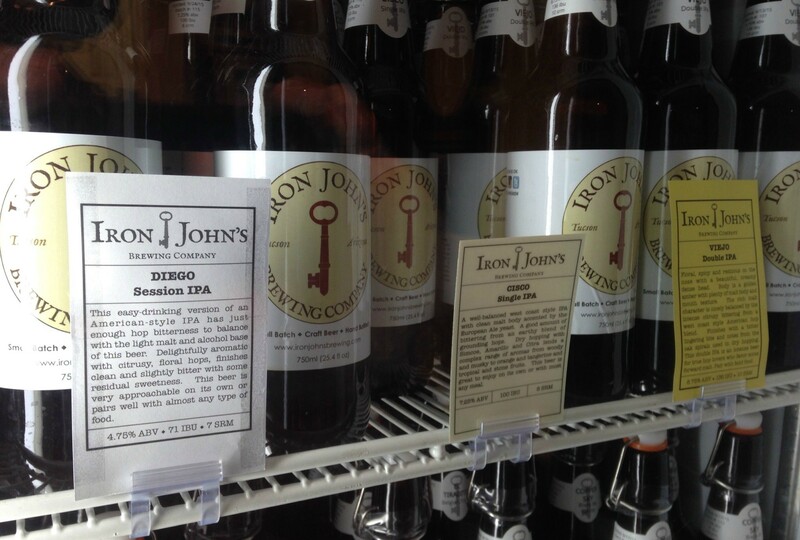 Iron John’s Brewing Co.
I’ll just say it: Iron John’s, all on its own, provides ample reason to swing through Tucson on a beer-related expedition. This is an incredibly small operation that earns its “artisanal” title and is managing to produce at least a handful of beers that are undeniably world-class. That’s not hyperbole. That’s fact. The frightening thing about it is that the guy behind the beer, John Adkisson, isn’t even doing this full-time, spending his days working in accounting. The brewery, therefore, feels less like a business and more like an extremely ambitious homebrewing project that somehow spun out of hand and ended up with state and federal permits. And that’s not a bad thing by any means—the industrial park location is tucked away and discreet, and allows easy access to meet the brewer, sample some mind-blowing beer and leave with bottles in hand from the cooler, all in a 15-minute period. As for what he’s brewing, it might be faster to list what Adkisson hasn’t produced on his tiny system. But it’s the audacious stuff that will make you gasp—beers made with rare, $100-per-ounce coffee varietals. One-batch barrel-aged sours. Perfectly balanced green chile beers. The variety is stunning, as is the sophistication of the sours in particular. I drank a peach sour at Iron John’s that Wicked Weed or Jester King would have been proud to call their own, and if it had their label on it would have beer geeks beating down the door. God only knows what the guy could do with unlimited resources at his disposal. Dragoon Brewing Co. feels like a riser—a fast-growing, crowd-pleasing brewery that has been able to grab the current craft beer zeitgeist without sacrificing all of its experimental side. Their taproom is spacious and slick compared to many of the smaller rooms in town, and it simply feels like a brewery primed to hit the rest of Arizona and perhaps push onward from there. Riding their flagship IPA (which is solid), they’ve made serious inroads in the last three years. Beyond the IPA, Dragoon does some very nice work in subtle, malt-forward styles, with nice (and often underrepresented) takes on styles such as Vienna lager and dunkel when I visited, both of which had a good feel for the bready, nutty characteristic of malt-forward German beer. Of course, no discussion of Dragoon would be complete without mentioning the double-edged sword that is the brewery’s award-winning “sour barleywine,” Lazarus. Currently rated as the #1 barleywine in the world on Ratebeer, it was the product of a botched barleywine fermentation that was salvaged by head brewer Eric Greene by pitching brettanomyces and sticking it in some unusual barrels for 13 months—port and cognac barrels that had then been used to mature whiskey. The result is quite unique, bracing, boozy and dark-fruit forward, but essentially impossible to replicate again. Which is to say, if you get a chance to try some of the small amount still in existence, don’t pass it up. 4. Sentinel Peak Brewing Co.
Sentinel Peak is a brewpub founded by three firefighters, and you have to appreciate the fact that they didn’t go the cliche route of naming literally everything in the building after firehouse lingo—write about beer for a while and you’ll realize how many of those there are out there already. Rather, it has the feel of a well-balanced, classic American brewpub, with the bonus of a cafe/coffeeshop operating in the same location. It doesn’t hurt that the paninis are solid, either. The beers keep things a bit on the simpler side, as one might expect from a classic brewpub—food friendly and approachable, for the most part. The Salida Del Sol Mexican amber ale is a nice nod to the better Mexican beers served not far to the south, and comes with a wedge of lime that you shouldn’t feel guilty about simply dropping in the pint, as is tradition. It’s not all just American styles, though—you’ll also find a black saison, Scottish ale and a banana-redolent German hefe. And of course, there’s naturally a chile beer—you’re not going to find a firehouse brewery without a spicy beer, and that’s a guarantee. However, as became something of a theme in Tucson, the chile beer was surprisingly well executed, although it’s hot as blazes on account of the ghost chiles. But for a beer that hot, it’s an accomplishment to come off as more than a PR stunt. I can actually see how this one might be useful as a blending agent—a splash in your lager, or perhaps in a cocktail, could give an interesting punch of heat. More than any of the other breweries I visited, Borderlands feels like it exists in the American Southwest. Perhaps it’s the (somewhat moldering) old building; a former train station/rail depot full of character and reportedly haunted. Or maybe it’s the tap list, which takes full advantage of the local terroir. 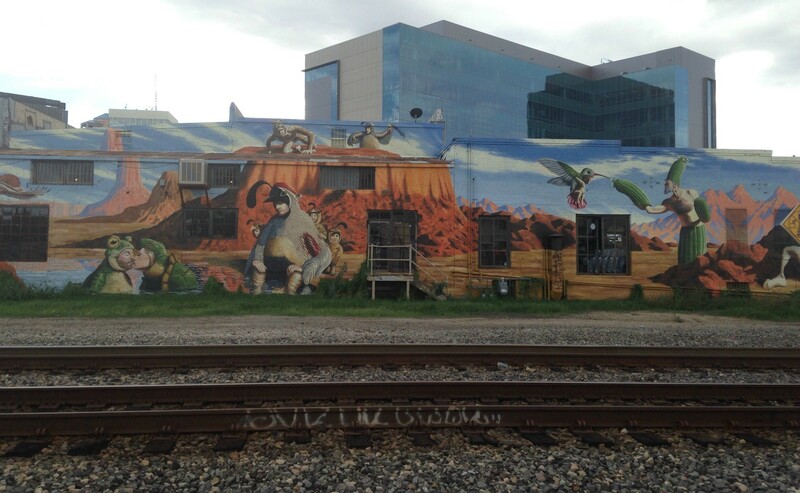 But if I was picturing one of these breweries as emblematic of the desert, it would be Borderlands, where a freight train regularly thunders by as locals raise a pint in the taproom. Borderlands has some strong entries in the year-round beer category, particularly the “Citrana wild ale,” which despite its name is actually a gose, and an excellent one at that. I would say that it would be a go-to session beer for me if I was spending time in Tucson, but given that it clocks in at 6.5% ABV, it’s actually a touch stronger than one might realize, and that no doubt contributes to its tangy, citrus-packed flavor profile, with just a touch of salinity. Also interesting is the Prickly Pear Wheat, which derives a pinkish hue and Jolly Rancher-like sweetness from the iconic desert fruit. Just looking at the current tap list reveals beers made with desert spices, herbs and fruit such as dates. It’s clear that this brewery has made a real commitment toward experimentation with local ingredients, and they’ve managed to incorporate them in such a way that they blend seamlessly into beers that are still crowd-pleasers for the weekend taproom crowds. 6. Pueblo Vida Brewing Co.
Pueblo Vida is quite small, a veritable hole in the wall in downtown Tucson that looks more like a beer bar than a brewery with its prominent bar and long, thin, single room. The beer, though, is damn good. In fact, Pueblo Vida may have had the best “batting average” for above-average beers that I tasted while in Tucson. They also had the best IPA I tasted in Tucson. Pueblo Vida keeps a smaller number of beers on tap than some of the other breweries, and seems to focus more on honing in on perfecting classic styles than getting really avant garde. They do have one very useful tool for experimentation, though, which is the weekly “infusion” series, where one of the standard beers on tap is infused with an extra ingredient to create a one-time-only new beer. Looking just at the last month, those infusion ingredients have ranged from horchata to tangerines, pears and papaya, each paired with different beers. The tap room feels a bit more urbane than some of the others thanks to being located on a main street, but the clientele is decidedly laid-back. The afternoon I visited, an aging hippie held court at and end of the bar, preaching the gospel of kombucha and sampling out little glasses of the fermented tea. You might look at that scene and see a microcosm of Tucson itself. Every city needs a brewery like Barrio Brewing Co. somewhere in its craft beer timeline—the trailblazer that paved the way for the modern crop of craft brewers who are now taking local beer to the next level. None of that would likely be possible without Barrio, which got the ball rolling in a much slower time when they opened in 1995. The downtown brewery and restaurant has been a staple ever since, known for cheap pints, bar food and private parties. The lineup is almost exactly as you’d expect, full of classic brewpub staples, with a blonde ale as the flagship—i.e., the final beer I downed in Tucson while waiting for my flight at the airport. The styles don’t jump out at you so much, but it would be a mistake to overlook their quality. Barrio got a nice reminder of this when they took home a bronze medal at the 2015 Great American Beer Fest (which I attended) for their Scottish ale, Barrio Rojo. In a city full of up-and-comers, Barrio was the one coming home with a medal. Beyond that, my only advice is to arrive at a time when there’s plenty of traffic on the nearby rail tracks. Any time the crossing guards are down, pints are only $3.25. What more do you want? Thunder Canyon occupies much the same role in Tucson as Barrio, although unfortunately it was one of only a couple beer locations I wasn’t able to visit during my 48 hours in town. It opened in 1997, an eternity ago for a brewery, and has been helping win converts to the craft beer cause ever since. One gets a laid-back sort of feeling from the place, which has two locations in downtown Tucson and the Catalina Foothills. The downtown location maintains a huge tap list that is only partially Thunder Canyon brews—of the 40 beers on tap there, 26 are currently from guest breweries, which tells me that this is a brewery comfortable in its own skin and its role in the community. The website lists a surprisingly large and varied list of beers that the brewery has dabbled with over the years, but if you visit today, expect to see mostly classic styles. With that said, even at an old-school American craft brewery like this, you’ll now see a 10% ABV imperial barrel-aged porter as a “classic style.” Which is to say, it’s quite the time to be a beer fan. Nimbus is the other Tucson brewery I didn’t get a chance to sample, the third spoke in the Big Three of original Tucson production breweries, having started in 1996. Braving the rather irritating, monkey-themed website, it feels a bit—okay, a lot—dated, full of auto-playing sound effects for everything one might click on. Still, with a lineup of classic styles (brown ale, red ale, pale ale, stout), Nimbus has persevered and remained a local staple. They don’t have quite the level of hype owned by the city’s newer generation of breweries, but there seem to be no shortage of dyed-in-the-wool fans who show for burgers and beer every night. Gentle Ben’s appears to be the business that really started it all as far as Tucson beer is concerned, although I have to be completely honest—I didn’t even hear the name mentioned during the time I was physically in Tucson. Nevertheless, when this brewpub started making its first beers in 1991, it was the only one doing so in Tucson—although this was after the building had already been in operation as a bar since 1971. Those first beers were “a catastrophe” according to the owner, but credit where credit is due—every scene needs a point of genesis. And if Gentle Ben’s is still satisfying the university crowds more than 25 years after they started brewing, they must be doing something right.